At the point of impact Seb has a half-car's width on his inside. He then drifts wide and clouts Max, damaging both their cars. So staying far left is gone straight away. You're right control is only lost post impact, but that doesn't dictate where the blame lies. At the point of impact, either Max locks up his left front tyre, or his left front and Vettel's right front touch. So Vettel is much further alongside than halfway. Edit: it's Vettel's front wing that touches Max's front left tyre. I wonder what Max said just after the incident; I could understand if he had said he never saw the attack coming, and turned into the corner normally. But if he didn't claim that, he did indeed turn into a car that was already alongside. Which would make him the one who caused the accident. He had to turn and take the corner at some point or he'd have run wide. He can't make his car disappear. was already lost, as Vettel was alongside. Just to make myself clear; if Verstappen had just remained on the outside there was a good chance Vettel would have had to fall back again and try later. I think you are somewhat underestimating the challenge of negotiating a sweeping fast left hander. The fact that I am yet to see an expert pundit blame Verstappen for that collision says it all. Yeah he had one aim and that was to keep Raikonnen behind him. Make that, "says a lot", and I agree. It is a challenge, but that should not have any influence on how we read the incident. I will look at the stewards' report with interest. What he should have done was let Raikkonen past then re-over take him in the first corner, that would have been fine........ Oh wait..
Max "It's never my fault" Verstappen is back. I think you could pigeon hole a lot of drivers into that statement. Yes let's just ignore all of Vettel's driving mistakes which also includes yesterdays qualifying and he had a collision in the race, just blame it all on Ferrari. It is not a mistake to pass Max. It is bogus to say that people trying to win championships should not try to pass Max. I would rather Vettel never win a championship rather than tip toe around Max because he drives like a wild man. In any case, he will learn only when he himself goes for a championship and others are out there carelessly getting into racing incidents with him. It was a mistake to try and pass him there. Vettel has had a few of these incidents where he blames the other driver for not leaving him space despite them clearly leaving him space. It was desperate and wild from Seb. He threw away a decent chance of second place there I reckon. Not at all. Vettel indeed kept the inner line, Max turned into him. The inner line is 'NOT' the racing line. As if I ever claimed that. 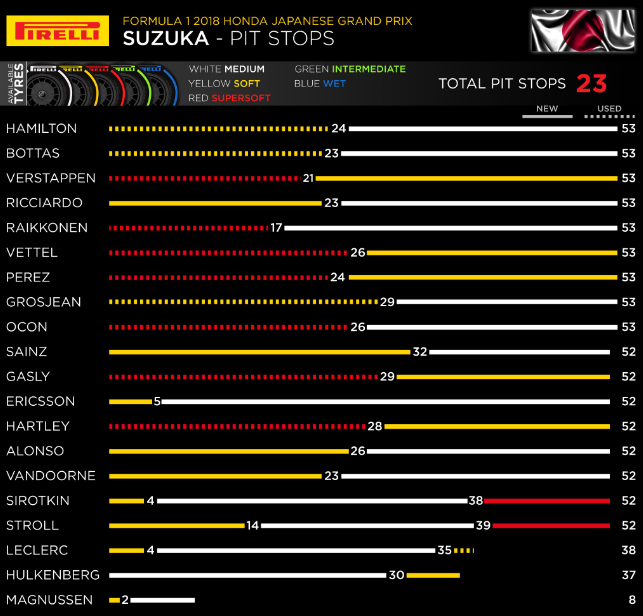 Coming away without any points has to hurt for Honda. Gasly got hurt by poor strategy and perhaps working the tyres too hard. But Hartley just vanished which sums up his season really. For TR there is definitely value in putting Kvyat in Hartleys seat now. Been watching Vettel too much. After today's 2 incidents with both Ferraris, can we safely assume Verstappen will never drive for this team in the future? The first thing that popped into my head when I read this was that famous quote by former US President LBJ about tents & bodily functions. I'm pretty sure Ferrari would still be interested in having a chat with him if the opportunity arises. My word I'm surprised he only called him stupid. With Magnussen getting let off today can we finalise close the book on the Verstappen gets special treatment argument? Surely they have to review the K-Mag punishment. That's as close to a black flag manoeuvre as I have seen for a while. Seems like my hope that people would see this and give up on the ridiculous "Verstappen gets special treatment" argument was in vain. I think I mentioned already that i've no idea how that got overlooked, and Magnussen has got form for moving late as well. They really need to stamp this out before a car gets seriously airborne, because that is what the endgame for moving about like this is. That move by Magnussen was a disgrace and I can't believe he got away with it. Sadly the precedent has already been set in multiple instances over the past few years and this sort of block appears to be acceptable now. Just watched the race. Quite a good race I think. I really expected Danny Ric to get and keep that gap down below 5 seconds so he would get the P3. Vettel certainly was clumsy in the Verstappen incident, I agree with the stewards that Verstappen re-entered the track improperly after his off in the Kimi incident, and Magnussen's move was indeed a disgrace. Good on Danny Ric, I really was cheering for him today. 71st win for Hamilton. 20 more until he equals Schumacher's record, which seemed nearly impassable when it was set. Lewis has won 20 races since Brazil 2016. At this rate he should do it by 2020. If he wins the rest of the races this year, which is entirely possible, he could conceivably do it next year. I understand Max sat out his 5 seconds with his pitstop, so Ricciardo staying within 5 seconds would have been worthless. Did Max, or not? Ahh, he did in fact. I'd missed that, makes sense now. Losing this title as seems likely to happen will be really tough to take for Ferrari. Laat season team and driver made errors, but it was reliability that ultimately sealed the deal. This time the reliability has been bulletproof. Team and driver errors have gone hand in hand. This race was a prime example of it. Ferrari made the error of sending theor drivers out on inters. Then in the window they had to set a decent time, Vettel messed up his lap when 4th or maybe even 3rd place were possible. Had he started that high then that stonking getaway off the line may have taken him well clear of Verstappen and we may be talking about a spirited second place. Vettel going for his version of 'that' Senna quote in regards to his move on Verstappen..... read into that what you will. Vettel is the German Senna; the modern day Ayrton. Really Max is more the modern day Senna. He drives fast and dirty, and he doesn't accept blame for his accidents. That was as cozy of a win as Hamilton could ask for. The championship is over now. I'd lay odds 99% that Hamilton wins it. Well deserved too. No major errors all year and he has made the difference for Mercedes; winning races and controlling the championship while Ferrari had the stronger package. Mercedes have upheld their end of the bargain too as they have now eclipsed Ferrari in development yet again. Ferrari are truly defeated and they will have to have doubts about whether they can hang with Mercedes for an entire season. We've seen two years in a row where they were in an extremely close battle for the championship before Mercedes pulled away in the later part of the season. Hamilton and Mercedes are truly making an assault on the record books and there's at least two more years where they will be up front. We'll see if Ferrari or Red Bull can overthrow them but Hamilton will firmly be the favorite going into next season. For Vettel, this has been a train wreck of a season. At this stage, this season has to be considered the worst of his career or at least second worst (behind 2014). There are mistakes almost every session now and I can't help but wonder whether he's in a bad place psychologically. He's at the age when most drivers produce their best performance level; combining their talent and speed with the savvy and experience that they didn't have as youngsters. Instead he seems more shaky and impatient than ever before. He'll need to have a good off-season to get away from the scrutiny and the cameras for a while and hit the reset button because this season has been a disaster. I think having Leclerc come to the team might light a fire under him. The alternative is that it could spell the end of his time at Ferrari. Make no mistake, if Charles gets the better of him, Vettel will be let go after his contract is up. You really think Ferrari would get rid of him? I think the more likely scenario if Leclerc is noticeably faster than him is that he decides to pull a Ricciardo and leave the team. Oh well...I can't wait to watch that teammate battle unfold. Almost certain it will be explosive. I basically look at both KMag and Verstappen as being racing thugs. Alonso managed to drive for them after the insults he threw at them in 2006 when driving for Renault and even after his proactive part in spygate the year after when Ferrari were apparently so badly damaged by the affair. Charles is a very polite person so stupid would be a very harsh word for him. Pretty much. One of them is a highly talented thug, however. Yeah which is a shame because he's the future of the sport. And then he does something like hit Kimi after cutting the chicane and blame Kimi for it. And I'm back to square one. Senna was equally bloody-minded in his driving and it was not an endearing quality, Verstappen has the same disease unfortunately. I think it disqualifies Senna from being the GOAT and ruins Max's hopes of ever attaining that status. Ricciardo makes him look silly most of the time with less inherent speed. Yep you want to like him because of his ability then he goes and acts like a douche-bag. Glad the stewards reconsidered their position on the Magnussen-Leclerc incident. I thought it odd that half a second late seemed as simultaneous to them during the race. Considering all the tools at their disposal it's a bit troubling they couldn't see that he didn't anticipate, but reacted. If I can use a stopwatch, so can they. Yep he clearly reacted to what Leclerc did.